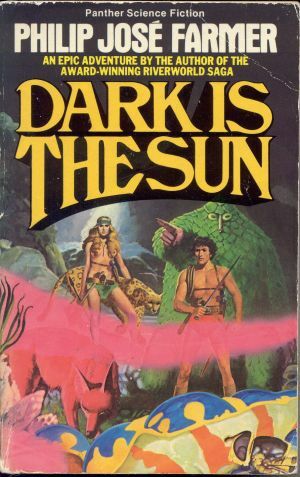 Dark is the Sun, by Philip José Farmer, Granada 1981(1979), 400pp. Great cover, isn't it? You can see Deyv and Sloosh the plant-man and the fox-like Yawtl. Oh, and Vana, who reminds me of other SF covers I examined closely as a kid. The story is set way, way, way in the future. The sun has expanded, and mankind moved Earth out of the way, and back again later. Now the Big Crunch (aka the Gnab Gib) is coming, and the protagonists need to find a portal into another universe before the world ends. This is not helped by the primitive culture that Deyv and Vana's people have lapsed into. The other human-engineered races of fish-people and the Yawtl are no better, though Sloosh's plant-kind are a little more clued in. It takes the ancient Shemibob to really get things moving. I have not yet read Farmer's Riverworld saga for the same reason that I have not yet read The Baroque Cycle -- too big an investment of time! Dark is the Sun is episodic and the plot is linear, but it held my attention throughout. Various characters are red-shirts and duly picked off. Some bits were amusing, like the sailboat-creatures and their cannonade mating. If you like gentle, fantasy-like SF then it is worth a read. Paul wrote: really, you really should read the baroque cycle. Jen and I just read Foreign Babes in Beijing and both enjoyed it. It made us want to move to China! Really great bit of lightish but insightfullish non-fiction. Worth it! After seeing Little Miss Sunshine (which you should see) I am considering Proust but I think I'd have to quit my job first, and it's not worth it at this stage. I replied: I will read the baroque cycle. I have the books, just have to chunk them in the hopper. I saw that Foreign Babes book a while back and was tempted. I'll probably read it now. I'd also like to see Little Miss S, since Toni Collette fascinates me. Speaking of Proust, did you ever read My Uncle Oswald ? Good old Roald. And did you read the Slate article on Madeleines?